Since the 1970’s, we have been developing the abilities of junior tennis players here at the Waltham Athletic Club. Our staff of skilled professionals has taught the game to thousands of children, providing them with a fun and healthy skill that lasts a lifetime. The summer tennis program is one of the highlights of our year, with our most in-demand coaches staying on to take advantage of the unique opportunity to focus for an entire week or more on players’ games. This concentrated and continued effort is invaluable for any player looking to expand and develop their tennis game, as we pride ourselves on our ability to build the skill sets of every player regardless of their age or experience. Barrett has been coaching with us at the WAC since 2003, and has always been a favorite of our junior tennis players. He has worked with countless players who have made the difficult leap from recreational to tournament players, while consistently promoting the concept that tennis should be fun, competitive, and physically healthy at the same time. His goal is to create well-rounded and dynamic players who can truly appreciate the game. Barrett has a business degree from Bentley College where he was a captain and starter on the tennis team and an MBA from Nichols College. Tim is one of the most sought-after instructors at our club due to his enthusiasm, knowledge of the game, and unique ability to forge lasting relationships with his tennis students. Despite not devoting himself to tennis until high school, Tim rapidly developed into an all-conference player at Springfield College and is able to share his experience and ability to enjoy quick improvement with his students. He is a remarkable coach and we are very pleased to welcome him back. Warren will again join us this summer, bringing with him over 20 years of experience coaching juniors. He played collegiately at UMass, has been a top ranked player on the adult circuit in New England, and has competed in national-level doubles tournaments with his daughters. Warren is a highly technical tennis coach who will provide our advanced players with invaluable knowledge and training. We are very excited to have Chris back on board with us this summer. Chris is a wonderful coach with a wealth of tennis experience, having played Division I tennis and taught at a variety of clubs in the tennis hotbed of Southern California. He was voted ab All-American High School Coach of the Year in 2016 and has trained with multiple professional players. Chris is an outstanding coaching talent who will help improve and grow the games of our advanced players. 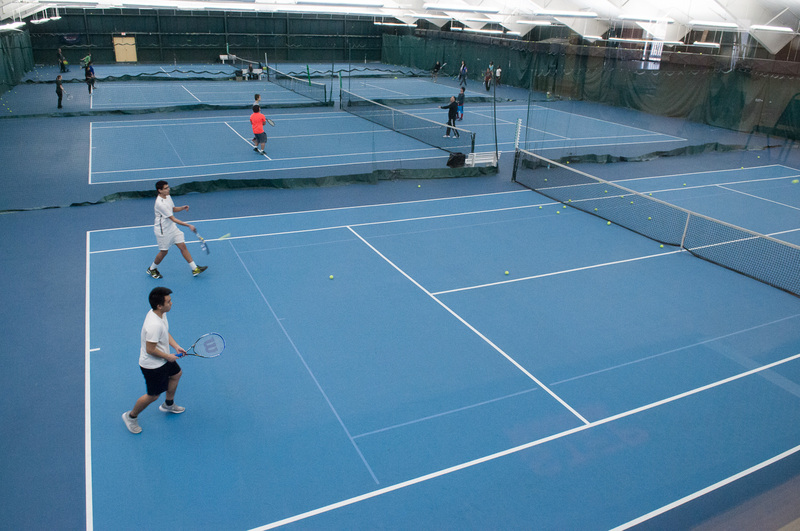 Our program is held primarily at the Waltham Athletic Club, where we enjoy access to seven tennis courts regardless of inclement weather. 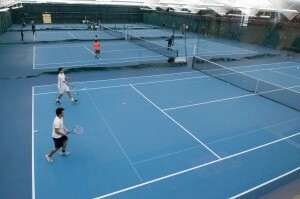 We also have outdoor courts available for our exclusive use, which the advanced players will use when weather permits. We will be holding 11 five-day sessions, beginning the week of June 18-20 and ending August 27-31. Each session will run Monday through Friday, with a half day (morning) only on Fridays. Students may enroll in any number of sessions; they need not be consecutive. We are once again offering a playday option on Friday afternoons. All intermediate and advanced level players who have participated in the week-long program may choose to attend. Each Monday morning, players will be split up into groups based on age and ability. Throughout the week, instructors will work on specific stroke techniques, conduct drills designed to improve the overall abilities of players, and play games that are fun but also develop key skills. We place a premium on individualized coaching – the student / instructor ratio is capped at 6:1. The rest is well-earned after a morning of hard work on the court – players should bring their own lunches. Water and snacks are available at the Front Desk for a fee. Players will compete in tennis games and matches, complementing skills learned during the morning sessions. The afternoon component is designed to be less strenuous while still focusing on tennis and general athleticism. This option is designed to serve both as a suitably intense companion to the morning instruction and as a stand-alone program, and is comprised of player-specific drilling, level-specific and coached match play, and tennis specific fitness. The instruction at this level is focused and intense and is appropriate only for serious tennis competitors. Players must be in the Advanced or Tournament Prep level at the WAC, or be evaluated and approved by a WAC tennis staff member to enroll. For students who need a later pick-up – players will be supervised by an instructor and enjoy free time on the tennis courts. Our staff is trained to accommodate players of all ages and levels. If you have any questions about a younger child’s ability to handle a full day (or morning) of tennis and related activities, please feel free to contact Barrett to discuss possible options. Please consider the Advanced evaluation requirement before signing up for the advanced program. You may sign up by printing out and mailing in the registration form (see link below), dropping by in person, or by calling the WAC at 781-899-5000, ext. 31 or ext. 32. We encourage you to contact Barrett directly at BAlston@walthamathletic.com with any program-related questions. Please be aware that last year we reached capacity during several weeks – sign up early to guarantee your weeks of choice.